This morning’s clouds are on their way out and will be replaced shortly with bright sunshine. Westerly breezes and the bright sunshine will allow for widespread warm temps with highs generally in the 70’s. A few upper 60’s are possible in the far north and a few low 80’s are expected in the usual SW warm spots. No precip is expected as thunderstorms over NY blocked any moisture from moving in our direction. Enjoy the warmth while it lasts because in the next 10 days, we’re looking at several inches of rain spread out across several events. A prolonged stretch of warm and sunny weather is not something I’ve seen indications of in the long range forecast. Unless you really enjoy drizzle, fog, and temps in the 50’s, today will be a great day for you. The cutoff low that brought all the clouds, showers, drizzle, and fog is about to be punted out with a one way ticket to the North Atlantic. We have about 3-4 more hours of the fog/drizzle before slow clearing this afternoon. This clearing will be initiated by the passage of a warm front which will bring with it scattered showers. By the early evening, most folks should be seeing breaks of sun with temps rapidly rising up to around 80. A cold front (read: dry front) will cross the area this evening and will provide just enough of a trigger to get a few convective showers going across southern and central areas. A few of these may develop enough to have a rumble of thunder but widespread thunderstorms are not expected. In terms of temps, we’re starting out right around 50 in most spots and we’ll end up right around 80 in most spots with the exception being the midcoast where southerly flow will continue to keep the fog and low clouds ongoing through much of the evening. More warm and sunny weather is expected for tomorrow before more clouds, drizzle, and showers arrive for Sunday and Monday. Today will feature drier conditions compared to yesterday as our storm system continues to spin and weaken to our east. Temps will remain cool as drizzle, fog, and clouds will continue to sit overhead. Look for highs ranging through the 40’s with a few 50’s in SW NH where a break of sun is possible in the late afternoon. More of us get sun tomorrow as a front moves through and finally brings some drier air into the region. Thunderstorms are likely to accompany this front in south western areas. Today will feature more of yesterday’s cool, cloudy, and wet conditions. Look for temps in the 40’s across the area as morning showers give way to afternoon drizzle. Winds will be out of the ENE and will continue feeding in low level moisture so that the drizzle can continue even in the absence of moisture aloft. This pattern will continue tomorrow and into Friday as well before a few rumbles of thunder will finally kick it offshore. Rain will arrive today from south to north and will continue through the evening and overnight hours before ending mid day tomorrow. A slow-moving system rich in moisture and moving in from the Caribbean is responsible for the rain and due to its tropical nature, a lot of rain can be expected. Totals of 1-2″+ are expected with the highest amounts along the coast where a coastal front will enhance lift for heavy precipitation. Rain arrival time is a tricky one because a little appendage has formed well ahead of the main system. 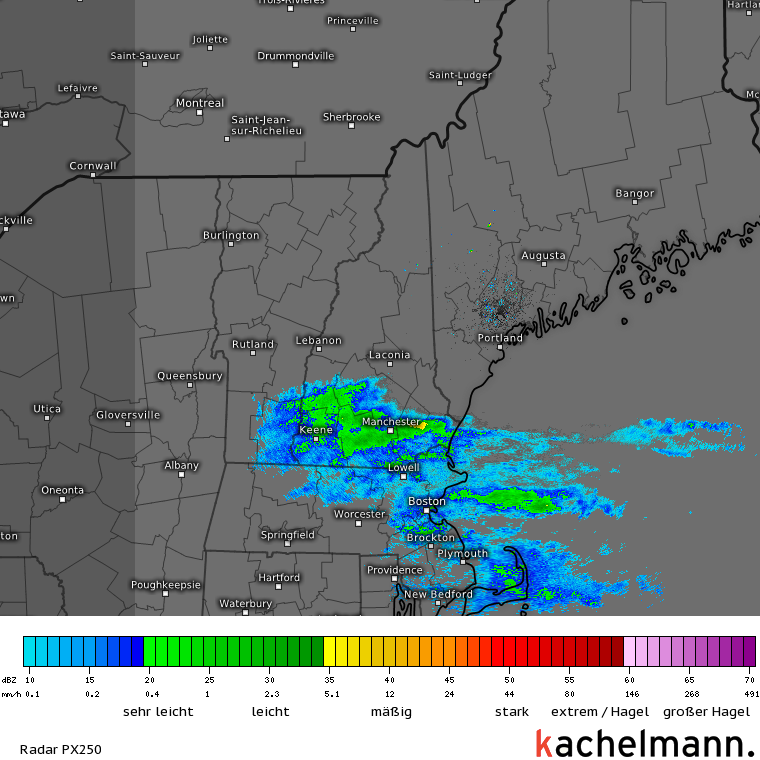 This appendage is currently bringing rain to SW NH as seen in this morning’s radar imagery. Sneak Peek Of Super High Res Radar Coming Soon from Kachelmannwetter. More information to come on where to find awesome stuff like this in the near future! This band of showers will drift north today bringing on and off showers to most of the region even before the heavier rain arrives this evening. Temps will be cool in areas of drizzle and fog today all due to winds turning onshore. Look for temps in the mid 40’s for most with low 50’s in far NW areas where a combination of partial sun this morning and downsloping winds will enable warmer temps. Rain, drizzle, and fog continue tomorrow and for parts of Thursday before warmer and sunnier weather arrive for Friday accompanied by the chance for thunderstorms. Today will feature mainly sunny skies, mild temps, and light winds as a weak front tries to make its way in our direction. Look for sunnier skies near the coast with the frontal system resulting in a few more clouds in the north. Highs will range from 55 in the north to 66 in the south with temps cooling off in the afternoon along the coast due to a sea breeze. Enjoy the warmth while you can, another week of mainly dreary weather is on the way! For more on that, check out last night’s post. I posted a couple of graphics this evening on twitter discussing my thoughts for the next two weeks ish of weather and I figured I’d share them here as well. They’re a little more technical than the stuff I usually post here but you’ll be able to get the general idea even without technical knowledge. 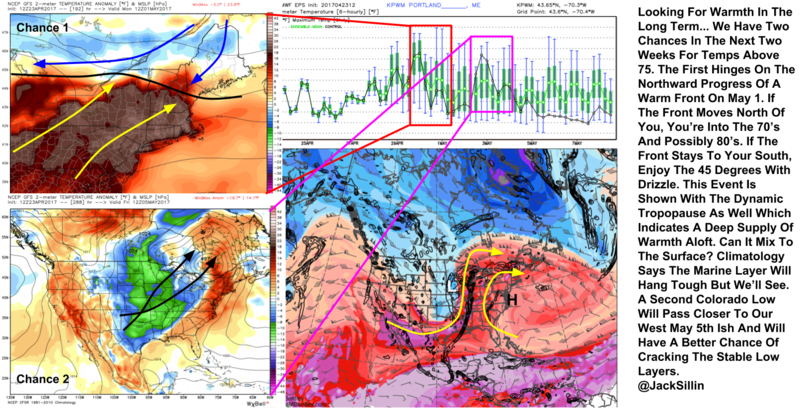 A warmer pattern is incoming! I’ll be back tomorrow morning with tomorrow’s weather!